In the end they won a union agreement which included a 4% pay rise each year for the next 2 years, the right of casuals to be made permanent after 6 months, site rates for contractors, increased redundancy compensation and improved rights for union delegates. Hopefully this last condition will assist in organising on the job to improve health and safety. Many members of the Socialist Party attended the picket regularly and were particularly impressed by the resolve of the mainly migrant workforce. For many of the workers it was a case of ‘win this dispute or lose your job’. The Baiada workers have clearly set an example of the type of boldness that the entire trade union movement needs to adopt. Unfortunately the boldness shown by the workers was not always matched by the leaders of the National Union of Workers (NUW) – the union that covers the poultry industry. It must be said that due to their political weaknesses, the leaders of the NUW made a number of strategic mistakes which only served to prolong the strike unnecessarily. From the point of view of strengthening the union in the shop, and in the industry, it is important to try and keep strikes as short as possible. When workers are able win while loosing the least amount of money possible it gives them confidence to continue the struggle once they are back on the job. This has to be a primary consideration for any organiser worth their salt. Disappointingly this did not seem to be at the top of the NUW leader’s minds. Rather they seemed to mistake the strike for a protest or a media stunt. For example on the first night of the dispute the workers mood was extremely militant with the main chant being “nothing in, nothing out”. There was a clear determination to shut down the plant completely in order to put maximum pressure on the boss. 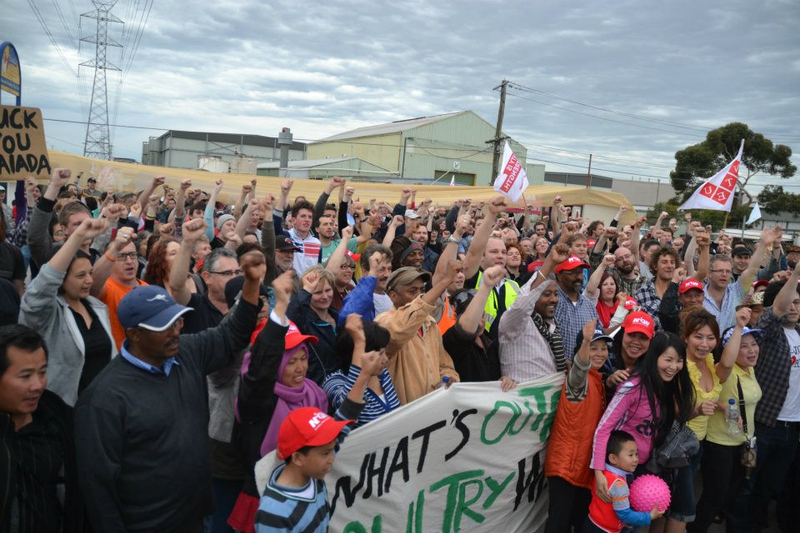 Despite the chants the NUW organiser did a deal with the boss late at night to let 15 trucks out of the plant. The meeting that was conducted to discuss this matter was a farce and ignored the long held labour movement tradition of democratic discussion and a vote on all major decisions. In the end the decision to let the trucks out was undemocratically pushed through to the utter dismay of the members – some were even in tears. Many members complained throughout the dispute that they were frustrated at the lack of regular meetings and report backs from the union leaders. Many members were also frustrated about the fact that the union seemed to have no real strategy to stop the company doing production and distribution from other sites. It was clear that the company was using a cold storage facility around the corner to store and distribute stock. Initially there were plans to organise a ‘community’ solidarity picket at the facility but the NUW leaders called the action off on no less than four occasions. The solidarity picket was subsequently replaced by a community BBQ. Community BBQs are good for building support for strikes, but are no replacement for hitting the boss at the point of production. The main power that workers have as an exploited class is to withdraw their labour. Usually the boss will respond to a strike by trying to replace the workforce or by moving production elsewhere. In both cases it is necessary to respond with direct action. The question of finances was also very important to the strikers. All of the workers were very low paid and struggle to make ends meet even when they are working. While the union was paying them $20 per day in strike pay there was desperate need to raise more funds in order to keep the workers going. Raising money for a strike fund is directly related to raising the morale of the workers. For reasons only known to them, the NUW leaders did very little to raise money from their members or from the broader labour movement. No meetings were organised in any neighbouring shops, no speaking tours, no site levies and no serious requests for funds were made to other unions. Rather the organisers suggested that the workers sign forms so that they could dip into their superannuation funds during the dispute! In the end the workers rejected the advice of the NUW and refused to use their retirement funds for financial support, instead questioning why the NUW wasn’t raising money from the broader labour movement. One worker asked why was it that the NUW could afford to give millions of dollars to the ALP but only $20 a day to struggling members? This point is especially important as the NUW leaders often claim that they are hampered from organising effective action because of the restrictive IR laws. The obvious contradiction is that these laws were put in place by the ALP, the same party that the union is affiliated to and that most of the leaders belong to! The act of going out to raise money for a group of striking workers is a political one. It trains not only the striking workers but also other workers in the methods of labour movement solidarity. It also points the struggle in an outwards direction therefore spreading the support base of the strike. While a thin layer of officials from other unions and a layer of left wing activists did attend the picket there was no real attempt to get rank and file workers from the NUW or other unions along. Even when the police violently attacked the picket late one night, seriously injuring one member, nothing was done to step up the action. It was at this stage that the NUW should have called upon Trades Hall to organise a cross union mass rally against the police attack. If we stand by and let the police, egged on by the State government, bash workers who are fighting against super-exploitation it will only encourage other employers to follow suit in future disputes. While the Baiada workers set a marvellous example in this dispute, they were somewhat setback by the political weaknesses of the NUW leaders. A key lesson to be taken from this strike is that as well as struggling against their employers, workers need to struggle to bring their trade unions under rank and file control. The Baiada workers had a plethora of ideas about how to win this strike. If they had been able to execute those ideas more effectively it is clear that the strike could have been shorter and more could have been won. The important thing is that we use this dispute as a stepping stone. We need to learn the lessons to ensure that in future disputes the positive aspects are built upon and the negative aspects are not repeated. This dispute has set a new bar at the Baiada plant. The challenge now is to strengthen the rank and file leadership on the site to ensure that the agreement is properly enforced. Further, we need to spread the type of militant determination seen from the Baiada workers throughout the rest of the poultry industry. Workers in every industry and in every workplace should take inspiration from this brave stand.